The first sensational trailer for Spider-Man: Far From Home has just hit the web (get it?) and it seems our friendly neighbourhood Spider-Man is going international. Set after the events of Avengers: Endgame, Far From Home will see Peter Parker – better known as the amazing Spider-Man – and his no less amazing friends from Midtown School of Science and Technology take a trip to Europe. As you might expect though, it doesn’t take long before Pete’s double life as a web-spinning wall-crawling, crime fighter catches up with him, and he’s forced to swing into action against a mysterious new foe. Tom Holland will return for the fifth time as the titular web-head while Zendaya, Marisa Tomei, and Jacob Batalon are back as MJ, Aunt May and Ned Leeds. There are a few new faces along for the ride as well including Samuel L. Jackson and Cobie Smulders who will reprise their roles of Nick Fury and Maria Hill respectively. Jake Gyllenhaal will also appear as a new deadly villain for the wall-crawler to face off against. The self-proclaimed Master of Illusion, better known as the menacing Mysterio. Mysterio, who’s perhaps best known for his unique look (he’s got a fishbowl for a head), is a classic Spidey villain, created by Stan ‘the man’ Lee and Steve Ditko, and uses incredible illusions to battle the web-head. Gyllenhaal confirmed he’s playing Mysterio with a hilarious Instagram post where he pretended to only just realise that he was playing the villain. Far From Home will mark the first time Mysterio appears on the silver screen but interestingly, he’s come closer than some ‘B-list’ villains to show up in a Spider-Man film. Back when Sam Raimi (blessed be his name) was working on Spider-Man 4, there were storyboards drawn up which would’ve revealed Bruce Campbell was secretly Mysterio. Before we see Spidey in Far From Home though he’ll return in the recently titled Avengers: Endgame which finally got a trailer after what feels like an eternity of waiting. Avengers: Endgame will see the Earth’s mightiest heroes come together once again to put a stop to the evil Mad Titan Thanos and undo ‘the snap’ that wiped out half the life in the Universe. Which we presume they do, seeing as Nick Fury’s back to less dust-like disposition in Far From Home. 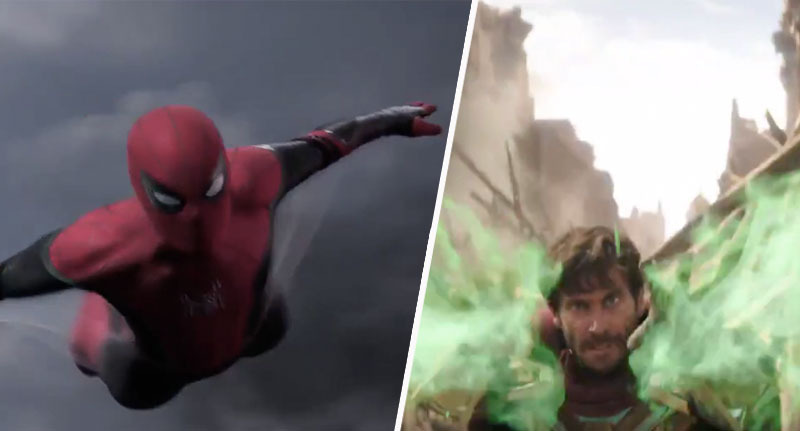 Spider-Man: Far From Home swings into cinemas on July 5, while Avengers: Endgame bursts into theatres on April 26.